For the Chinese/English bilingual newspaper, see Sampan (newspaper). Not to be confused with the commune in France Sampans, Jura. A sampan (Chinese: 舢舨; pinyin: shānbǎn; Pe̍h-ōe-jī: sam-pán) is a relatively flat bottomed Chinese wooden boat. Some sampans include a small shelter on board, and may be used as a permanent habitation on inland waters. Sampans are generally used for transportation in coastal areas or rivers, and are often used as traditional fishing boats. It is unusual for a sampan to sail far from land as they do not have the means to survive rough weather. 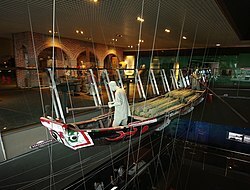 The word "sampan" comes from the original Cantonese term for the boats, 三板 (sam pan), literally meaning "three planks". The name referred to the hull design, which consists of a flat bottom (made from one plank) joined to two sides (the other two planks). The design closely resembles Western hard chine boats like the scow or punt. Sampans may be propelled by poles, oars (particularly a single, long sculling oar called a yuloh) or may be fitted with outboard motors. Sampans are still in use by rural residents of Southeast Asia, particularly in Malaysia, Indonesia, Bangladesh, Myanmar, Sri Lanka and Vietnam. Wikimedia Commons has media related to Sampans.